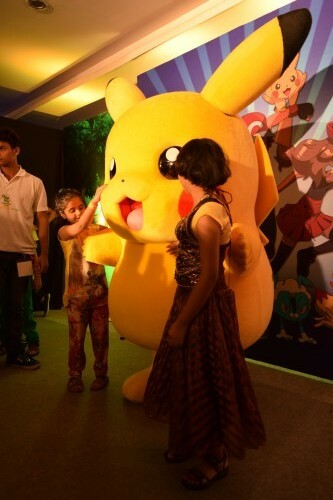 Pokémon rocked at the World Children Expo, Delhi. This was the first time where Pokémon had a meet and greet with the fans in Gurgaon, Delhi. And we wouldn’t shy away from the fact that Pokémon steeled the show! Pokémon kid’s all time favorite character at the event encouraged footfalls and gave an opportunity to experience the brand up-close.Last year, one of the major attractions of the event was Angry Bird zone but this time it wasn’t just one. The event had two major stars to excite the crowd, Pokémon and Angry Birds; the two of the favorite characters amongst kids. At World Children Expo 2015, Kids had an amazing time meeting and getting clicked with their favorite characters, Pokémon & Angry Birds. Visitors both kids and youth enjoyed the opportunity to play live Angry Bird games in Angry Bird Zone and also participate in Pokémon gaming zone! Participating in World Children Expo has always been fun but this time it was even more exciting for us to see the response which Pokémon received. The excitement was appreciable when Pokémon performed for the audience. The grand success of this event signals more such events coming up in near future. Here’s Pikachu meeting his fans. Looking at their smiling faces made us feel warm and fuzzy inside. The grand success of those carried out in the past, signal more such events coming up in near future. Stay tuned! Next PostNext Angry Birds a big hit with Chandigarh kids!